Our Boundary conversation continues! This week’s episode topic is, unfortunately, a popular one about how to draw boundaries and protect yourself from a narcissistic mother. I’m providing four tips that you can put into play in your life right now to protect your own happiness. 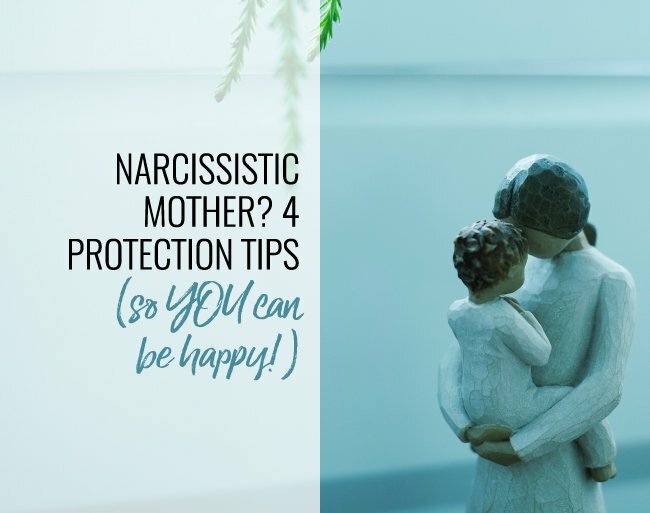 First, I’ll break down some of the tell-tale signs and behaviors of maternal narcissism so you can gain clarity before we move onto the next steps you can take to get empowered in your relationship. What are the different kinds of narcissism? Some people exhibit narcissistic traits or tendencies and other have a diagnosable personality disorder. There are two kinds of maternal narcissists; the engulfing narcissist, who is smothering and works to dominate and control all aspects of the child’s life. To the outside world, this type can present as an attentive parent but in this case, looks are deceiving. The other type is the ignoring or more neglectful maternal narcissist. These mothers under function when it comes to providing attention, guidance, and care. Both types lack the most important attribute of healthy mothering, the capacity to exhibit compassion and empathy. Other possible indications of maternal narcissism are being in competition with the child, pitting the siblings against each other by choosing a “golden child” who serves as the narcissistic reflection of the mother and a “scapegoat” who is used to take the blame for anything that goes wrong or not according to the mothers plan. The scapegoat role can be shared between the non-golden child siblings or it can be the permanent role for one. The family agrees that now that the mother has designated that person, the scapegoat, that all the family’s problems are because of that person. Narcissists will also tell lies to make their point, exaggerate their accomplishments or elevate their importance. They are incredibly thin-skinned, super ego-driven, and vengeful. They keep a running tally of every perceived slight and have a desire to make someone pay for it. Having a narcissistic mother means that everything is about them. Your wedding can become about them, your relationship can become about them, sometimes they will befriend your friends because they want to take everything you have if they think it is of value just to prove they can. Your accomplishments also become theirs. Every talent you have is something they got from you. They are actually jealous of their own children. If any of this sounds familiar, let’s move onto the 4 tips that you can use to protect yourself and your happiness. The first tip for you to build any kind of protection is that you have to be in acceptance of what you down deep know is true because you can’t fix what you can’t accept. The child in you may want to remain hopeful but if the facts provide evidence that your mother is a narcissist, it is time to save yourself. The second tip is to build your knowledge about this mental illness. If you think you have a narcissistic mother there are many books out there on the subject and there are a plethora of real experts for you to learn from. Try to spend a little less time on Netflix and more on becoming well versed in the ways of maternal narcissism so you can learn specifically about the type that your parent may have, and make online connections with other people who’re experiencing the same thing right now. The third tip is to draw boundaries. You have to take action towards the person that you fear the most despite the fear. When it comes to narc mothers it may look like limiting contact, stepping back, not picking up the phone or giving yourself permission to take a break. If the situation is extremely toxic and/or includes abuse of any kind you may choose to go No Contact. You do not deserve to be abused by anyone and it is your job to protect yourself. And if that means going to no contact, then do it. If you can’t go no contact or don’t want to you can try to use The Gray Rock Method which I have talked about in other episodes, where you basically make yourself incredibly uninteresting because narcissists hate bland and boring and the hope is that they will lose interest in you and move onto the next shiny object. The fourth & final tip I have for you in this episode is to focus on you. Put all of your energy into your own healing. Join a group. Get into therapy. Get educated, as I said, is one of the other tips, but focus on you because you deserve your own love and attention and focusing on you also means building healthy relationships with other people. You can find other mother figures, women who are older, who are decent, who are actually good moms to their kids or find a mentor, someone whose energy attracts you that you feel would be kind, compassionate, empathic, and build those relationships. So I hope that you found this episode helpful and if you did, please share it on your social media platforms. As you know, we’re in Boundary Bootcamp season so keep your eyes open for my Wednesday Wisdom livestreams each week at 3pm EST on my Facebook business page, which is Terri Cole, LCSW, and in my all female FB group, which is called Real Love Revolution. This video is very well done. Sadly it’s content is pretty familiar to me. My question is regarding this regarding how to manage one’s relationship with a narcissistic mother who also has dementia. It’s extremely difficult and lonely. Thank you Terri Cole! Oh how I wished I’d had that link a couple of years ago! Thanks for posting Terri because it helps to know how many others are going through the same thing and how they are coping. My mother is now in care because she became a danger to herself, it’s taken 6 months to stop feeling guilty about that (even though it was her doctor who signed her in to care) for once in my life I feel free and able to become the person I always wanted to be – soft and kind instead of hard and hiding behind my own defences. Thank you for sharing your wisdom. All of your videos not only serve as a confirmation that what some of us are living is real but also that we deserve every support system we can get. Validation in cases like these is a game changer because as you said, saying your mother is narcissistic in our society is not understood most of the times. But having a narcissistic mother and/or living with one is the worst. Thank you. Wow! Thanks so much Terri. This is really, really helpful. Happy to help, Emma! Thanks for watching! Thank you so much, I needed this lesson, now I can handle my situation, whatever u said about narcissist mother it’s so true, it’s never enough for, I feel so better after watching ur video, now m gonna take care of me.. God bless you for the noble works, ur so caring and loving. Hello Terri. I have a question following on from your comment regarding behaviours that we pick up from being raised by narcissistic parents. In my case it is dealing with anxiety, especially when I’m worry about my children, even though they are now grown men. I am working hard on learning and growing in recovery, but still find this a very hard obstacle to overcome. Thank you for all your sound advice and support. Yours E’lanne. why so many narcissistic mothers??? I had one too, it was mostly hell…my brother the golden boy…and you get the rest. for a little time to years at a time. A lot of guilt, I ran away & seem to run still. She died. and abusive to me. My mother abandoned me in the end. The pain is excruciating. Help me out please, if you can. My problem is I’m separated from a narc mum but I have a nearly 12 yr old, quite mature and sensible, for her age and a sort of step daughter of 15. There are also 2 other step daughters of 25 and 23 but both left as soon as they legally could (16 and 18). I worry about the narc effects on the two remainers but I’m not sure whether to let them into this knowledge and understanding or whether this would just be too much for them to comprehend. Any advice and guidance or direct experience of anyone else in the same situation would be greatly received and appreciated. Can you recommend an affordable therapist in the North Georgia area? So many say they are experienced with children of Narcissistic mothers, but when I meet with them I find that I spend more time trying to explain to them that this is a real disorder and not just a demanding person. I walk out feeling either discouraged or like an unappreciative daughter with a side of guilt for not honoring my mother. I am a 60 year old scapegoat whose mother was diagnosed when the “golden son” got his Masters degree in counseling years ago. As part of his training he was asked if the family would come for a 1 week family counseling intensive. We did and the counselor told me at one of the wrap up sessions that my mother had Narcissistic Personality Disorder. I asked the counselor if he told my mother and he said, “no, it wouldn’t help her” and that “the sessions were for my brother”.I was so angry at the counselor. I wanted someone to validate my feelings towards my mother because she was able to hide behind her beauty and charm. Since I am now retired from my work I realize that I have NEVER had hobbies or activities that I was allowed to pursue as a child. My favorite color was my mother’s favorite color, my favorite movie was my mother’s favorite color. even the flowers at my wedding which my mother refused to attend were her favorite flowers which I have growing all over my yard and I hate the smell of Gardenias! She sold her house and spent it all taking her “friends” from church on expensive cruises and now has my baby sister calling me to let me know what my share of the cost will be to pay for her continued stay at a pricey nursing home and oh by the way my brother/ “golden child” will not be able to contribute an even share, although he has been living rent free his entire life and he and his wife have been left a large inheritance from her family. I explained to my sister that my mother would need to give me a call (that was 6 months ago…) Since then my mother has taken to calling my mother-in-law who has been more like a mother to me just to let her know that I am not willing to help her out. My mother-in- law knows my mother’s got problems but doesn’t know how deep they are or how deeply they have impacted me. Is it too late to get help? Where can I go to get help? This is something that I’m currently experiencing. I’ve recently began self healing and care after years of narcissistic abuse from my mother. I’ve detached and now she’s become oddly nice and using manipulative tactics to bring me back to her. Ex: gifts for birthday, forcing me to engage in conversation,compliments, liking things on my social media, Most recently a health issue that may not be as serious as she suggests. She knows that if it pertains to her health; (she’s tried this before)I can’t turn my back. Now I’m trapped. She’s manipulated me into conversations and helping her. So now to her all is forgiven and if I return to cutting off all communication; I look crazy!I don’t know what to do. Tiffany, I want to first acknowledge you for taking the steps healing and self care. This is important and I encourage you to continue taking the steps to do what you need to do to heal. And yes, that may include forgives (which is for your benefit, not hers) and cutting off communication. You know what you need to do for boundaries to best take care of yourself. I am cheering you on and sending you strength. my mother is extremely passive-aggressive and will call me names and then claim that she never said that when I confront her. She recently called me a “tub of lard” knowing that my weight is a difficult issue for me and I’m extremely self conscious about it. She’s even told me that she had dementia and can’t remember anything she says. I don’t believe she has dementia, it’s an excuse. She’s even gone so far as to deny it by saying that her phone dialed me and left a voice mail. Just insane excuses. She’ll say anything to get out of it. She never, ever admits to any of it. She’ll tear me down with names and then call the next day “needing” something from me with zero mention of anything she said. Oh, the guilt trip is insane. She’ll leave me voice mail crying, balling and rambling on and on, trying to get me to pity her. She made herself the center of attention at my daughter’s wedding by calling the morning of the telling her she can’t come because she had no transportation even though she knew someone was picking her up. She called and called all day while we were getting ready, stressing my daughter out and ruining her fun. Well she showed up dressed in rags and totally embarrassed everyone. I’m just at my wit’s end. I’ve been such a sucker…going back repeatedly only to be torn down again. I appreciate your videos very much. Thank you for being here Deborah. I see you. Keep coming back. Wow. This was so incredibly insightful and informative I had to take notes as some things gave me chills. I am so grateful you created and shared this and am touched by all the comments I read. My situation is that both my parents are narcissists. My mother is schizophrenic as well. And as the only child I was the one to take care of her and protect her from him. Who is narcissist but has borderline personality disorder as well and is recently developing dementia, per my mother. I’ve recently broken free from regular contact and am only communicating by letter (need to hire a ghost writer) and talk every couple of months. This has been life changing. Here’s the but. I’m wracked with guilt because hc he takes such terrible care of her. I can’t afford to take on their financial responsibility but it hurts me to see her like this. She came from a very good family (he targeted her) Years ago her brother squandered away her inheritance. I don’t know how to live with myself if I don’t step in but am engulfed by anguish if I have any contact. I’m more charmed and enamored by her ironically. For all her needing and missing me she doesn’t care about me at all when I talk to her unless it’s hat she wants to hear. I’ve been having more nightmares about him hurting me. I feel like getting involved does nobody any good unless I fix the situation. I strayed a bit but that pretty much depicts the situation. Please let me know if you have any thoughts or insight. I’m too in the thick of it.